When ESL Australia decided to upgrade their new events studio in Auburn recently they called us for some advice on theme lighting. We did a site visit the following days and met their projector manager Brad Baldwin. A stage was already built in the studio which had pre-existing white floodlights mounted overhead along with LED strip lighting. They wanted to theme the remainder of the studio in a way where the venue could be lit to suit any request. They also wanted to be able to control all the lighting from a different room but don’t have to run DMX cables. We needed to come up with a solution that had the theme lighting not be washed out by the white floodlights while being conservative with costs. We explored a variety of lighting options including providing demo kits for on site testing to find the best solution. We also looked into Artnet, wireless DMX, and computer based consoles for easier programming and controls. 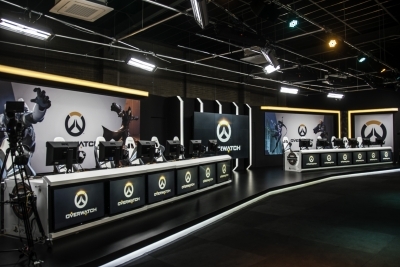 After demoing a number of different lighting and effect fixtures, a total of 20 of PHANTOS LED PAR, 2 of XMLITE 120W LED Spot Moving Heads, and one MLB 600W Hazer were installed just in time for their recent official Australian launch for a video game called Overwatch by Blizzard Entertainment on May 28th. Approximately 200 gaming professionals and enthusiasts attended the event.